EXMO unites professionals from all over the world. Developers from Spain, Russia, India and Thailand together with successful financial advisors from Great Britain, USA, Lithuania and Singapore are working on the best cryptocurrency platform. Bitcoin is known to simplify and secure transactions and we are contributing to the Blockchain growth. Exmo offers trading in a fairly good selection of some of the more popular cryptocurrencies for euro, US dollars, Ukrainian hryvinas and Russian rubles. The UAH, however, can only be used for trading in Bitcoin and Ether. The other three accepted fiat currencies can be used for trading in Bitcoin, Litecoin, Doge Coin, Dash, Ether, Waves, Zcash, Tether, Monero, Ripple, KickCoin and Ethereum Classic. Interestingly, Exmo also offers an exchange service between USD and EUR. 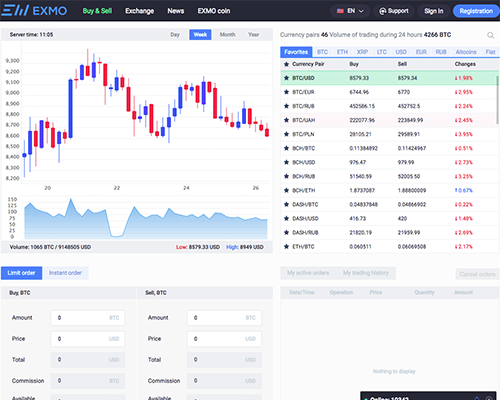 Compared to some other exchanges, Exmo appears to offer a decent portfolio of alt-coins, whereas some platforms only offer trading in Bitcoin. It appears that Exmo does not require immediate customer verification in order to start trading. Obviously, however, at some point it requires clients to upload a copy of an ID document. Like most crypto platforms, Exmo does not offer the option for leveraged trading, but a simple spot exchange service. Other exchanges, like like Kraken, CexIo, bitFlyer and Quoinex for example, also offer trading on margin. There are some forex brokers, an ever growing number in fact, who have expanded their portfolio by including CFDs on some of the more popular cryptocurrencies for speculative trading. Some, like eToro, have even set up dedicated crypto investment portfolios. Exmo is providing numerous and convenient ways for its clients to fund their accounts. The exchanges accepts bank transfers and credit and debit cards for all types of fiat currencies, PayPal for deposits in USD and EUR, OKPay, PerfectMoney and Neteller for EUR and USD, Yandex Money for RUB and several other methods of payment through e-wallets and prepaid cards. The fees vary, depending on the deposit type, with a range of 1-8%, fixed fees or percentage + a fixed sum. Exmo also accepts deposits in cryptocurrencies, most for no fee, except for Kick - 50 KICK. Withdrawals are possible through the same options as deposits, for different fees, depending on the type. Exmo is a cryptocurrency exchange based in the UK and is not regulated. Nor it needs to be, at least for the time being. There is also another legal entity, mentioned on the site as a service provider: Finerta Business Inc., registered in the offshore zone of British Virgin Islands. According to its own site, for the company work developers from Spain, Russia, India and Thailand, in partnership with financial advisors from Great Britain, USA, Lithuania and Singapore. The company says it has 700 000 clients from all over the world and has several language options, including Chinese, but we get the impression that the exchange is mostly targeting clients from Russia and Ukraine – it accepts deposits in RUB and UAH and provides funding options mostly popular in these two countries. Besides, there are some sections of the site with Russian as default language. Not that there is something wrong with that, of course, but it seems that in January 2017 the Russian communications megaregulator Rosskomnadzor has blocked the access to the platform from Russia. Exmo has set up a mirror site for its Russian clients. Judging by the user comments and reviews, Exmo is a fairly easy to use platform with decent reputation, although there are complaints that its servers are often down for maintenance. Exmo is a valid option to consider, particularly if you’re seeking a smaller cryptocurrency exchange. The currency support is much better than many other crypto exchanges, and there’s a reasonable selection of altcoins to choose from. It’s also nice to see so many payment options, which allow more people from more locations to be able to use it. Despite these advantages, it’s important to be cautious when signing up to a cryptocurrency exchange, particularly when it’s less well known, as in this case.